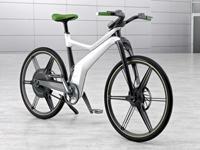 smart ebike: a new urban movement.
" With the new ebike, smart is presenting its second idea for locally emission-free electric mobility on two wheels. The trend-setting electric bicycle study, which will be premiered at the Paris Motor Show 2010 together with the highly regarded smart escooter is suited for both effortless city biking and sporty use. Unlike the scooter, the ebike´s drive is not controlled via the throttle grip. Instead, it delivers extra power when the rider pedals. The muscle power-electric hybrid drive offers four power levels. The high-tech bike also sets standards in terms of appearance and concept, starting with the futuristic look and the discretely designed lightweight wheels to the technical features in detail. Characteristics that the ebike and the escooter have in common are typical smart design features, simple handling and the integration of smartphones: the smart drive kit app that has been further developed also performs numerous functions for the ebike, for example those of a speedometer and a navigation system. 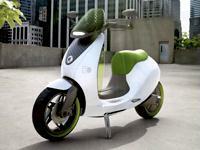 .......... "
smart escooter: decide for yourself.